You sit down at your sewing machine, ready to start a new project. Fabric? Check. Thread? Check. Correct presser foot? Check. New needle? Umm… I know they’re here somewhere… Here they are! No, those are Jeans needles, and I need Ballpoint. Maybe I can just use this one… Eek! Nope – it’s definitely too big for this t-shirt knit. Argh! Where did I put them!! And suddenly your relaxing afternoon of sewing turns into a frustrating search for a tiny package of needles. That doesn’t happen to me (much) any more. 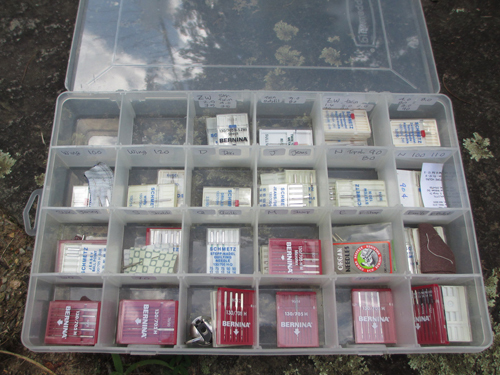 I keep all my needles in a big plastic box. I’ve even labeled the sections! I keep it on a shelf with my thread cases, but if I wanted, I could hang it on the wall using the tab at the top. When I have a needle that’s “used,” but not enough to discard, I pin it to a little piece of the project fabric and put it in with the new needles. That way I don’t forget what type it is, and have it handy for the next time I need that sort of needle. Did you know that many stitch problems can be cured just by using the right needle? Who knew such a tiny thing could create such big trouble? Here’s a great table of common symptoms and solutions. How do YOU store your new and used needles? Hi, Jo! Where did you buy the needles storage case? Thanx. 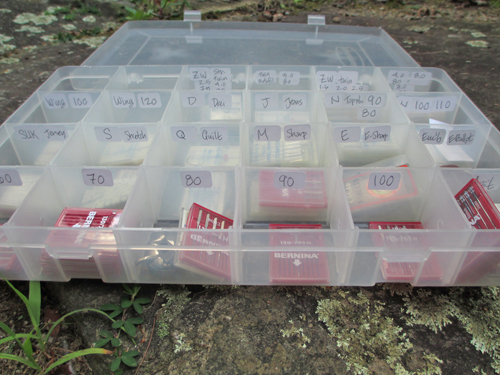 You may also try the fishing tackle (storage container) section of your local W-M. This is the container I use to also store my Bernina feet. The slots are adjustable. I bought a case like this at Harbor Freight. 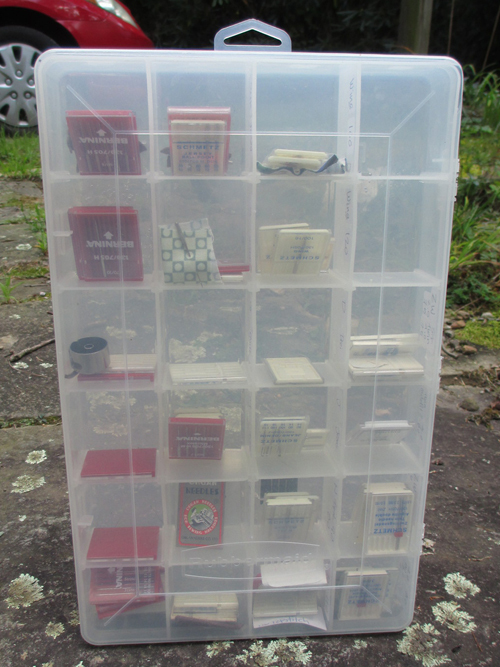 They have lots of storage ideas great for sewing/craft enthusiasts. I also labeled the outside lid as it was easier for me to see without looking through my bifocals. Happy sewing!! 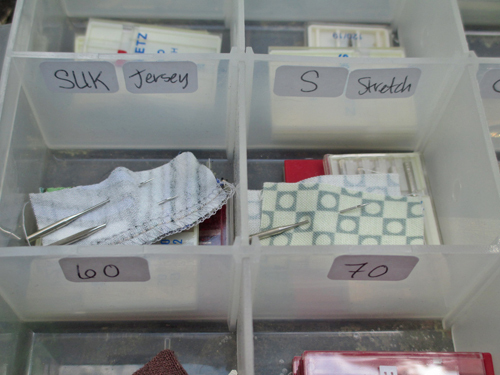 I use one of those storage boxes made for those embroidery cards for applique or counted cross stitch. It is just the right size to fit in my drawer and has division that I could adjust if I wanted to. Holds all the size needles in each separate compartment.